We specialize in resource-efficient processes in the field of forming technology. Our area of expertise includes technologies such as flashless or flash-reduced forging, cross wedge rolling, hydroforming and hybrid forging. We consider different materials in the field of forming technology, such as steel, stainless steel, aluminium, titanium and Inconel. 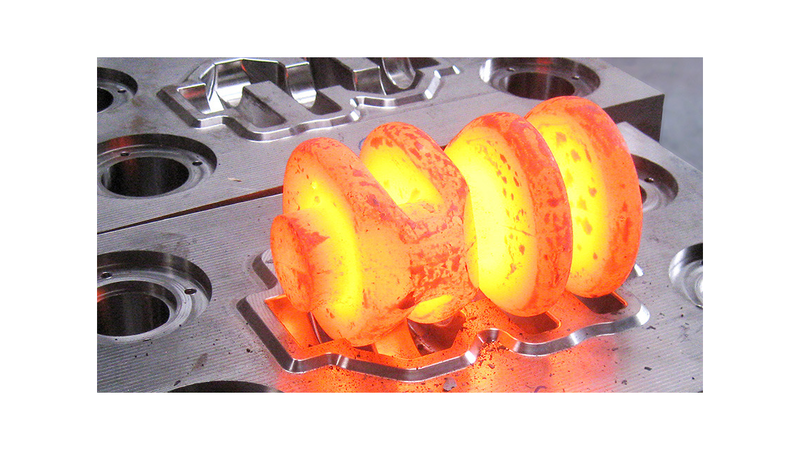 We have more than 20 years of experience in the flashless forging sector, primarily with complex component geometries. Specification of requirements & definition of goals: Together with you, we identify the goals for your production and incorporate your requirements for the component to be designed as well as the forming processes (e.g. in terms of costs or quality characteristics). Analysis of current state: In this phase, we systematically document the current state. This concerns, for example, an existing component, including the manufacturing process or the materials to be used. Design of forming processes: This phase includes, for example, the creation of mass distribution diagrams, the interpretation of the stage sequence by means of FEM simulation and their evaluation, such as regarding form filling, forming, temperature or wear. Construction of forming tools: Based on the simulation results, the design of the forming dies is done using current CAD software (Catia, Creo). The tooling is done either by you or by one of our contracted external tool builders. Forming tests & evaluation: The implementation of forming tests includes not only the planning and execution of experiments, but also the collection and analysis of measurement data (e.g. process or geometry data).